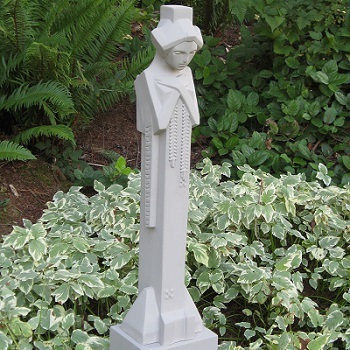 This striking sculpture is an authorized reproduction of a statue that was personally designed by Frank Lloyd Wright for the Midway Gardens in Chicago. Cast in stone, it shows the clean lines and architectural integrity made popular by a 20th century, American master builder. Matching pedestal elevates the piece with a complementary design(sold separately). Recommended to store inside during winter.